Part of the reasoning for the DUST long/GDX short posted earlier is the fact that the three largest components of GDX; GG, NEM & ABX, which cumulatively account for about a 20% weighting, have all made nearly vertical & over-extended runs into key resistance level on the daily time frame. As the initial tag of resistance levels from below often produce a reaction, I believe the odds for a pullback in the gold mining sector is extremely elevated at this time. 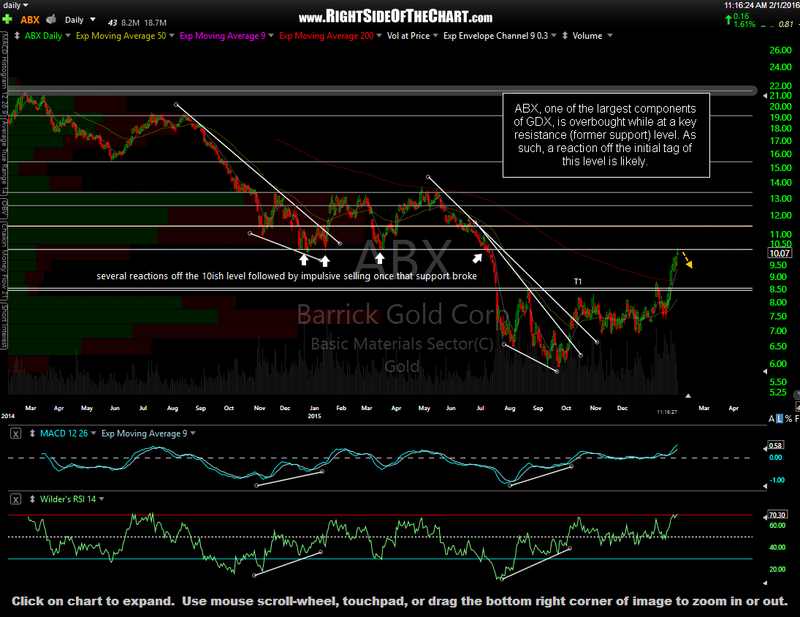 Notes on the DUST long/GDX short trade can be found in the previous post. Please note: As this post was associated/tagged with the ticker symbols for ABX, NEM, & GG as well as DUST & GDX, all 5 ticker symbols will appear under the Active Short Trades category. 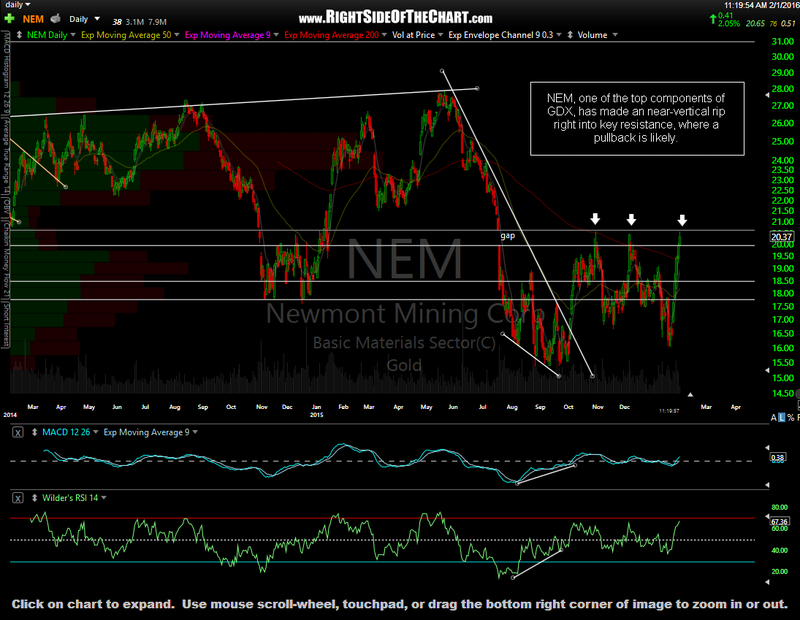 Although one could certainly short any of all of these stocks in addition to or in lieu of DUST, ABX, NEM & GG are not official trade ideas and as such, do not have price targets or suggested stops listed. Also note that although one would go long DUST to short the miners, DUST will be appear in the Active Short Trades & Short Trade Setup categories while this trade is active. Congrats Art. Next near-term upside target for DUST would be set just below the 13.60 area. I took a decent position of DUST in which I will likely book partial profits around 13.52, especially if we get there today. DUST also has some decent support around 12.70 & is current trading just 6 cent above that level as I type. Next S/T support around 12.50. Thanks Randy, I had entered DUST at 12.50, just before your initial post about this, with a little skepticism, but your data is putting me a little more at ease. 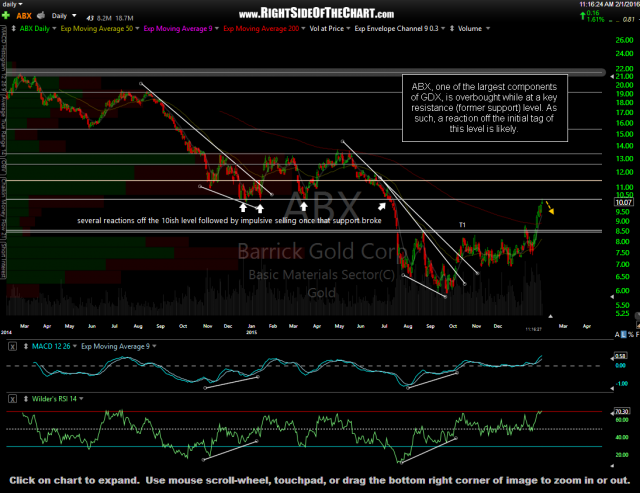 PBB- FWIW, I’m also expecting a pullback in GLD which, if it occurs soon, would help confirm this short on the miners. 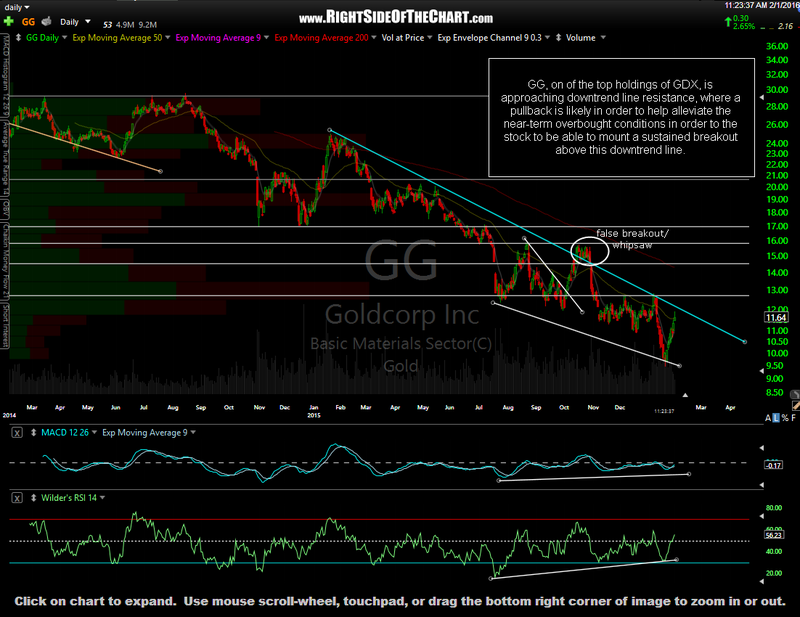 I’ll post a chart of GLD in the trading room shortly. G-luck on the trade!